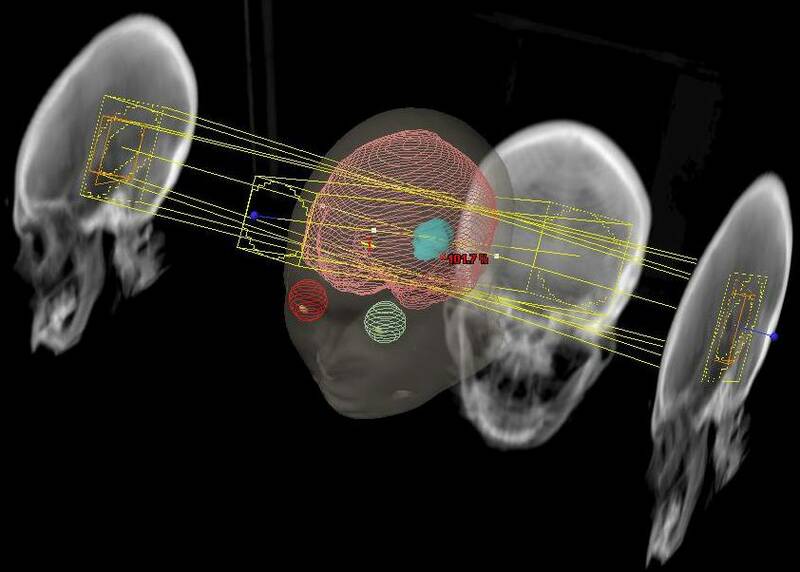 Read the review article on side effects/complications of brain radiation here , here, here, here and here; and radiosurgery here. There are different types of brain injury (here) and standard doses (here). There are standards as to the proper dose of brain radiation from the NCCN go here. Safe doses are described for the brain, brainstem, optic nerve and spinal cord. There is evidence that even low doses of brain radiation can effect memory (see outcome data from RTOG 0214 trial here and here) and so there is interest in a new technique to try to spare the area of brain stem cells (go here , here, here, here). CNS radiation necrosis: The patient above had a history of a solitary brain metastasis from non-small cell lung cancer. The lesion had been resected and the patient had received radiation therapy to the area. A follow-up MR exam revealed a ring enhancing region in the left parietal-temporal area on post-gadolinium enhanced images (white arrows). A FDG PET exam revealed no tracer uptake consistent with post-surgical and post radiation change. (Also note that chemotherapy may affect the brain, go here). (See the side effects listed below from the RTOG.) Radiation kills cancer cells by damaging the division of rapidly dividing cells. Since adult brain cells no longer divide (with some exceptions) it is in fact relatively safe to expose the brain to radiation. 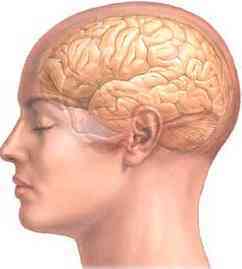 The 'safe' dose to the brain (6000cGy) in much higher than for other organs of the body (go here.) Picture of radiation necrosis of the brain here. There is more risk of brain complications when the dose per fraction is high, e.g. radiosurgery (go here.) 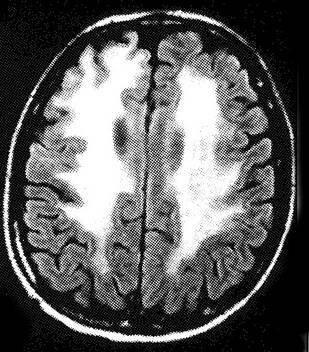 Patients with MS may be at higher risk for radiation complications (go here). Neurotoxicity. 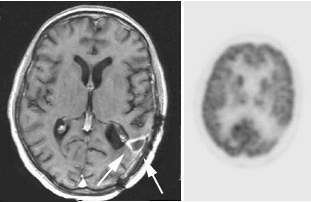 Cranial fluid-attenuated inversion recovery magnetic resonance images from a 67-year-old patient with primary CNS lymphoma 1 year after achieving a complete response to whole-brain radiation therapy. The patient developed memory failure, gait ataxia, and incontinence in the postradiation setting. There is increased signal throughout the cerebral white matter, cortical atrophy, and ventricular enlargement. In general, the dose commonly used to treat brain metastases (300cGy X10) is thought to have very little long term risks. In patients with primary brain tumors where the doses are higher there is some risk of brain injury when the doses approach or exceed 6000cGy. The picture on the left is from a patient who had high dose whole brain irradiation combined with chemotherapy. One of the troubling complications resulting from cranial irradiation is permanent alopecia. The psychological effects of being diagnosed with cancer and the subsequent treatments are tremendous burdens on our patients. Hair loss is one of the most stressful side effects for patients undergoing oncologic treatment with either chemotherapy or cranial irradiation. Temporary alopecia is a dose-dependent treatment effect that occurs in humans approximately 23 weeks after radiation exposure and usually resolves within 23 months after completion of radiotherapy (RT).. Doses as low as 2 Gy in a single fraction have been shown to cause temporary alopecia.. The historical data from the atomic bomb survivors in Hiroshima indicated that epilation was noted with estimated doses of only 0.75 Gy. The doses reported to cause permanent hair loss vary widely. A recently published analysis documented that a dose of 36 Gy (2 Gy/fraction, 5 d/wk) was reported to cause permanent alopecia in a range of 080% of patients (median risk, 5%) and that a dose of 45 Gy resulted in a risk of 5100% (median, 15%) of permanent alopecia.. International Commission on Radiological Protection Publication 85 has stated that permanent epilation occurs at 7 Gy (single fraction).. In this paper, we present a doseresponse relationship analysis for alopecia persisting at least 12 months after completion of a course of fractionated cranial irradiation. The D50, the follicle dose at which 50% of the patients developed permanent alopecia, was estimated to be 43 Gy. No statistically significant difference was found in the D50 between patients who received radiosensitizing chemotherapy agents (i.e., cisplatin, temozolomide, and carboplatin) vs. those who received agents that were not radiosensitizing . Radiation doseresponse relationship for permanent alopecia; 95% confidence interval of dose D50 see graph.